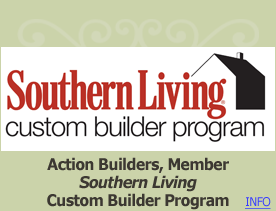 Action Builders is excited to participate in Southern Living magazine’s exclusive Custom Builder Program. Top residential custom builders across the Southeast have been carefully selected as members of this privileged program. We are honored to be one of the builders selected. Southern Living defines the builders invited in this Program as “well established professionals that are selected for their strong presence in the market place, excellent reputation in the community, and outstanding accomplishments. Furthermore, each builder member must demonstrate superior quality and attention to detail, and be financially sound with excellent credit based upon reviews of its suppliers and financial institutions.” In other words, Southern Living has taken the work out of your search for a reputable builder. You have probably noticed in talking with different builders that they talk about “quality,” “service,” and “great craftsmanship” in describing their company and their homes. We use those words on our website; however, the difference is those are not just words to us but they are truly how we live and work. For Action Builders our selection in the Southern Living Custom Builder Program is another validation that we are committed to exceeding your expectations for us and your custom home. In choosing Action Builders for your custom home, you will have access to Southern Living House Plans created by some of the country’s leading architects and designers. You will find each home design brings the latest ideas in architecture, interior design, and livability. As you are deciding on your Southern Living House Plans, we can provide a complimentary study set of the plan to help you in your decision. Once you have decided on which Southern Living House Plan you would like built by Action Builders, we will then provide you the home plan as our thank you gift for entrusting Action Builders with your home. As a member of the Custom Builder Program, Action Builders has the opportunity to network with some of the nation’s best custom home builders at the annual Southern Living Custom Builder Conference. This is a great way to share ideas and gain industry insight from other top-notch custom home builders. So take the guess work out of choosing a custom builder and go with Action Builders who has already been selected and endorsed by the 7th largest monthly consumer paid magazine, Southern Living. We know you expect the best and we will deliver that on your custom home. Browse our Southern Living House Plans.